One of Golf Digest Magazine’s Best Young Teachers joins one of northern Michigan’s top resort destinations. Jason Guss, a rising star among the country’s young PGA golf instructors, has joined the team at Otsego Club & Resort in Gaylord where he will launch the resort’s new golf academy. Jason comes to the Otsego Club after 11 years working with Rick Smith, one of the games top instructors. Guss was on staff at Smith’s golf academies at the nearby Treetops Resort in Gaylord, and Tiburon Golf Club in Naples, Florida. He’s earned national honors from one of the most influential publications in the game, as Golf Digest magazine listed Guss among its Best Young Teachers in 2010. He was also twice selected by Golf Digest as one of the top 20 teachers in America under the age of 40, the only teacher in Michigan to earn that prestigious recognition. Guss is also one of three instructors selected by the magazine to create their first set of hour-long instructional DVD’s called The Golf Digest Clinic. With his addition to the Otsego Club, Guss joins the Osprey Recreation group, one of the state’s leading golf course operators and the owners of the Black Forest and Wilderness Valley courses on the western outskirts of Gaylord. 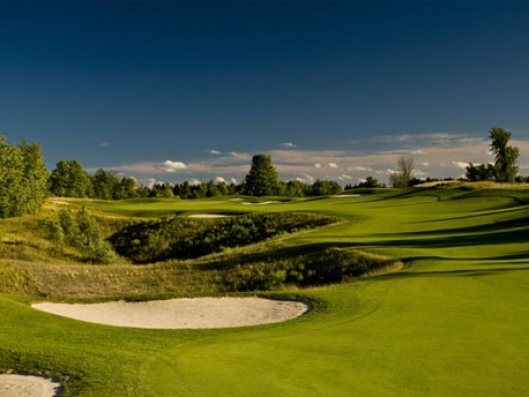 The Black Forest course was designed by renowned architect Tom Doak and has earned national recognition as one of the top courses in the country and the state. Jason said his apprenticeship with Smith, and Smith’s top assistant, Henry Young, was invaluable. Guss often assisted Smith, while Smith coached such elite players as PGA Tour stars Phil Mickelson, Rocco Mediate, Lee Janzen, and Jerry Kelly to name a few. In addition, Guss also taught at the Brett LeBrocque golf academy in Melbourne, Australia, one of the best golf schools in that country. “Jason Guss is truly one of the most talented and elite young golf instructors in the country. We are very excited to be able to have someone of his experience start developing golf academy programs for Osprey Recreation and the Otsego Club,” said Phil Cutting, Director of Hospitality and Recreation for Osprey Recreation. In the coming season, the Otsego Club and the new golf academy will offer a variety of instructional programs including one, two, and three-day sessions, on-course instruction, as well as individual lessons for beginners to elite players. There will be a variety of programs for junior players with special instruction for those with ambitions to play collegiate golf. A program tailored for women will also be a feature of the new academy. Guss has been a keynote speaker for the Michigan PGA Section, sharing his own insights into the golf swing. He filmed four Golf Channel Academy instructional pieces, and appeared as a guest on Michigan Golfer Live. Founded in 1939, Otsego Club & Resort has been a prominent fixture in northern Michigan and is the oldest operating private ski club in America. The resort’s two 18-hole courses are complimented by Doak’s Black Forest course, and the original 18-hole layout at the Wilderness Valley complex. In addition, the resort offers 117 lodge rooms, suites, and condominiums. There are more than 24,000 square feet of meeting space, and three restaurants, including the award-winning Duck Blind Grille and The Pontresina, a multi-year winner of the Wine Spectator Award of Excellence. Visit www.otsegoclub.com for more information. Previous post: Will The New Polara Golf Balls Change The Way You Play Golf?